Central Presentations Ltd (CPL) delivered stage design and full technical production for the 2016 Tax Assist–an annual conference for accounting specialists. The conference was staged in the Caernarfon Suite at Celtic Manor Resort in Newport, South Wales. 2016 Tax Assist designed and technically produced by Central Presentations Ltd. Led by Lee Gruszeckyj, CPL has provided sound, lighting and video for the event during the last few years. The most successful elements of the 2015 conference and the company’s 20th anniversary were the starting point for this year’s stage and set design along with some new components. 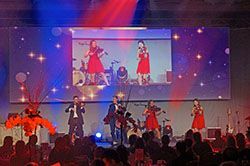 A hybrid approach to the design ensured a slick transition from conference session in the afternoon to full-on gala dinner and entertainment in the evening. At the back of the stage was a 40-foot wide starcloth – a bit of tasteful twinkling that can work timelessly in most ‘show’ environments – which also featured two sets of door portals for entrances and exits. Downstage of that, and specifically for the conference section of the event, was a 15 meter wide white voile, and in front of that a further 30 feet by 10 feet section of draping. The layering of different materials created a three dimensional appearance which could be further accentuated by lighting and differentiating the layers behind the set. A 10-by-3 meter deep stage with curved edges installed for the conference. The flying facilities in the room are good, so selected house trusses were used for lighting, PA and projection positions. The screen was fed by a doubled up pair of Panasonic 12K laser projectors running through a Barco S3 processing system which took care of all the content storage and screen management including creating PiP displays. Input sources included laptops running Keynote for the presentations and PlaybackPro for the VT play-ins, plus one Sony VHC-100 roving camera used to record speakers during the conference section and provide a relay for the live entertainment during the evening. For sound, CPL’s new d&b Y-series speakers were used complete with Y7P cabinets for delays further down the room. E8s were utilized for foldback and front fill and there was a row of V-SUBS along the stage lip. d&bonce again provided sonic excellence in a small and neat package. CPL provided a Yamaha CL5 console for comedian Jo Brand to mix on during his hour set, followed by an after-dinner DJ, while the band brought his or her own FOH mixing console and hooked into CPL’s system. Lighting for the conference consisted of a mix of generics and LED sources that were used to create an even white was. Among primarily used lighting was the ARRI L5Cs and Source Four LEDs - that enhanced flesh tones and eliminated shadows. Lighting also included a blend of Martin and Clay Paky moving lights: 10 x CP Mythos rigged in the roof above the stage, 10 x Sharpies, 10 x Martin MAC Auras on side-stage stands shooting across for fillers, and four CP A.leda K10s with B-EYE lenses on the stage. All lighting was run from Avolites Quartz.